Paige, daughter of missionaries, is forced to give up the baby she gave birth to at the age of 17. Awareness that she has a daughter somewhere has dominated her life for the last 22 years and she has always dreamed of a reunion, despite the closed adoption. The missing Tehra has had a difficult life – certainly not what her young mother had anticipated for her after the adoption. So she also had always longed to know her mom. Paige, as a forty-something single, is given the opportunity to reconnect with her daughter. The relationship gets off to a somewhat shaky start, chiefly as a result of important information that Paige’s parents have kept from her. Chris Fabry, the author of this novel, has penned many titles, including War Room, which was made into a popular film. 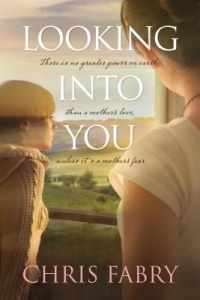 I found Looking Into You to be a heart-warming and well-told tale as mother and daughter take this journey together of starting a long over-due relationship.